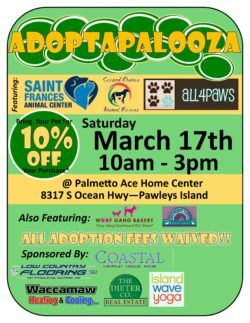 Please join Palmetto Ace for our annual mega adoption event being held on Saturday, March 17th from 10am-3pm. This public event will feature some of the most adorable adult dogs and puppies looking for their forever homes from some of our local animal shelters. Saint Frances Animal Center, All 4 Paws Animal Rescue andSecond Chance Animal Rescue will be among the crowd that day hoping to find loving homes for these pets. Bring your pets to the store that day for a special 10% discount on all* regularly priced merchandise! ALL ADOPTION FEES ARE WAIVED!!! All fees will be sponsored by community businesses. Want to be a sponsor? Contact Amy Strope by email at astrope@palmettoace.com, or send a message on facebook. Lulu’s Paw Boutique and Woof Gang Bakery & Grooming Pawleys Island will also be a part of this fantastic event. Can’t adopt, but you still want to help? Enjoy a hot dog for a small donation that will go to our local shelters. You won’t want to miss this!